It’s underway: the Andrés Manuel López Obrador presidency and his pledge of a Fourth Transformation for Mexico. He won by a landslide in a July 1 election that marked a repudiation of the status quo. What comes next has stoked both hopes and worries over whether his particular brand of populism means shifts as dramatic as the prior three transformations he’s referring to: Mexican independence, formation of the republic, and the revolution. Any student of Mexican history can tell you those three events took years. López Obrador, also known as AMLO, has six, given that the Constitution allows for one term of that length. He begins with the strongest mandate of any Mexican president in decades, control of Congress, and enough state legislatures to push through constitutional reforms. As Mexico charts a new path, AS/COA Online's Carin Zissis, based in Mexico City, counts down the first 100 days of the López Obrador presidency. Check back for regular updates. Note: This article was initially published on December 1, 2018, and subsequently updated as news became availabile. On the eve of marking 100 days in office, AMLO made a call for reconciliation, saying he was fed up with political infighting, during a stop in Jalisco and public appearances with Enrique Alfaro—a governor at times framed as a chief opposition figure. During the event, Alfaro, who left the Citizens’ Movement party after his electoral win in July, said, “It will always be an honor to help the president move the country forward.” He also, with AMLO’s prompting, gave a hug to the his campaign rival from AMLO’s party MORENA, Carlos Lomelí. As discussed on Day 98, López Obrador faces a diminished opposition and embattled counterweights. After the outlet Reforma accused the presidency of using the tax agency to intimidate its reporting, AMLO said Friday the charge was a falsehood before he himself accused Reforma of biased reporting and failing to cover matters such as electoral fraud and corruption. The outlet responded later in the day with a video showing its front-page coverage of these issues over the years. A roundup: The presidency may just be getting its start, but news outlets and commentators are marking AMLO’s hundredth day with assessments of a leader “in a rush to implement the new and demolish the old, like none of his predecessors before him,” writes Raymundo Riva Palacio in El Financiero. ADN Político offers an interactive tour through the tragedies, the controversies, the alliances, and the tuitazos (top tweets) of AMLO’s time in office so far. Nación321 compares the first 100 days with that of prior president Enrique Peña Nieto in terms of approval, press conferences, campaign promises, and more. Nexos offers a series of articles analyzing the creation of the National Guard—the landmark legislation of AMLO’s honeymoon period. Proceso’s latest issue is titled “The 100 Days” covering the president’s foreign policy, his controversial use of citizen consultas, the economic outlook, and his use of daily press conferences to launch corruption accusations. An eye to the future: At six years, Mexican presidential terms are long. But with no reelection, speculation about who could come next starts early. At least one poll puts Marcelo Ebrard, AMLO’s foreign secretary and a former Mexico City mayor like the president, ahead of the capital’s current head of government, Claudia Sheinbaum. Sunday, March 10 marks 100 days of the AMLO government, and there’s no question that he’s coasted through his honeymoon on a wave of popularity (see Day 94). Given that Mexican presidents frequently kick off their terms with high levels of approval, that’s not necessarily a surprise; a look back over the past 30 years shows this to be the case. Interestingly, only one other president, Vicente Fox, tops AMLO on approval ratings at the end of his first quarter (see Day 90), and Fox rode in facing similarly high expectations, given that he was the first president in seven decades who wasn’t from the Institutional Revolutionary Party (PRI). That doesn’t mean the president doesn’t face pressures. The economy is one issue, given credit rating agency downgrades and warnings, accompanied by lower economic growth expectations (see Day 96). In fact, on Wednesday, a senator from MORENA, AMLO’s party, suggested sanctioning rating agencies that are deemed to operate without objectivity. Yesterday, the president walked back the idea, saying his government would “respect the opinion” of the agencies. But, as Bravo Regidor points out, the area where people will want to see results first is in the battle against violent crime. January 2019 saw Mexico hit another harsh milestone, given that it marked the month with the highest number of murders on record and increased homicide rates in 17 out of 32 states. Moreover, femicides are on the rise. Today, during a speech before the Supreme Court in recognition of International Women’s Day (IWD), Jan Jarab, who heads the Office of the UN High Commissioner for Human Rights, said the number of women murdered in Mexico tripled from 2007 to 2017 and that, in January alone, 300 women—an average of 10 women per day—were killed. In recent days, gender issues have dominated Mexican headlines after a controversy over how battered women’s shelters would be directed (see Day 96) as well as over abortion after the state of Nuevo León changed its Constitution to say that life begins at conception. Today, during another IWD event, protestors yelled at the president when he suggested issues such as abortion could be decided by a referendum. One thing that is certain is there is a long way to go. The first 100 days mark amounts to less than 5 percent of AMLO’s sexenio. Please keep checking as-coa.org for updates on Mexico. It’s been a rocky week for Mexico and ratings agencies. As reported on Day 94, Standard & Poor’s (S&P) lowered its outlook for both the country and Pemex from stable to negative. S&P followed suit for Mexican firms such as telecom company America Movil and beverage company Femsa. Then, yesterday, Moody’s warned that violence could harm revenues for the oil and tourism sectors over the course of the next 12 to 18 months. In addition, this morning the OECD revealed it had lowered Mexico’s GDP growth projections from 2.5 percent to 2.0 percent in 2019 and from 2.8 percent to 2.3 percent for 2020. Finance Secretary Carlos Urzúa today cautioned to take the ratings agency news with a grain of salt, given that S&P lowered its outlook, not the investment grade. Yesterday, AMLO commented that S&P “is punishing the country for the neoliberal policies applied for the last 36 years, which were a complete disaster...but it’s up to us to pay for the broken plates.” Indeed, the AMLO government inherited a heavily indebted state oil firm that’s seen production declines since a 2004 peak, but analysts warn the agencies’ moves also stem from concerns that his government’s plan to address Pemex’s problems fall short (see Day 77). Same-day update: This afternoon, MORENA senators announced plans to submit a proposal on Thursday that would require the National Banking and Securities Commission, or CNBV, to regulate, sanction, or revoke operating rights for credit rating agencies when those agencies function without objectivity or their evaluations "deliberately threaten the financial stability of a company or sector," said MORENA Senator Salomón Jara. In other news, after blowback over concern that the AMLO government would replace funding for battered women’s shelters with direct cash to victims, Interior Secretary Olga Sánchez revealed this morning that the shelters will come under the management of her secretariat in conjunction with the National System for Family Development and Non-Governmental Groups. Following the approval of a constitutional reform to create a National Guard (see Day 48), the legislation passed another hurdle today by earning the ratification of a majority—17 in total—of state legislatures. The next step is for the reform to head back to the executive branch, followed by a process that involves passing implementation laws. In general, most Mexicans are happy with their president so far, as shown in a Mitofsky poll from last week (see Day 90) and an El Financiero poll out today (see below). The latter shows AMLO’s approval down eight points but still has him as the president who starts with the highest level of support in 30 years. Still, when it comes to his initiatives, approval runs the gamut. While 80 percent of respondents consider his battle against fuel theft (see Day 40) successful, only 29 percent feel the same about investigations into a helicopter crash that killed the governor of Puebla and her husband, a senator (see Day 25). Some 66 percent say he’s done well when it comes to respecting freedom of expression, but only 45 percent say the same about his foreign policy. And even as 79 percent agree with his moves to cut public-sector salaries (see Day 10), just 27 percent back cuts to government funding for daycare centers (see Day 69). Meanwhile, credit ratings are sending warning signals. This morning, Standard & Poor’s (S&P) lowered its outlook for state oil firm Pemex to negative. On Friday afternoon, S&P did the same for Mexico overall and warned that the country faces a one in three chance of a downgrade in the next year. One reason given was the government’s moves to rein in private-sector involvement in Mexico’s energy industry. S&P’s moves come about a month after Fitch downgraded Pemex two notches with a negative outlook (see Day 60). AMLO wrapped up his first 90 days in office with some important steps. First off, on February 27, he swore in Monterrey private-sector leader Carlos Salazar Lomelín as the new head of the Business Coordinating Council, better known as the Consejo Coordinador Empresarial or CCE. As the new president of one of Mexico’s most powerful business groups, Salazar Lomelín told AMLO that “we should make investment an obsession” in order to reach 4 percent GDP growth. Then, this morning, Foreign Secretary Marcelo Ebrard joined the president’s daily press conference to launch a 10-point plan to support the rights of Mexicans living in the United States. The proposal, which Ebrard suggested U.S.-based Mexican ex-pats could vote on in a referendum, includes measures such as increasing mobile consulates and expanding social programs. The secretary also said a round of consular nominations will head to the Senate for approval on Tuesday. Ebrard’s announcement coincided with Mexican Interior Secretary Olga Sánchez Cordero traveling to Washington to meet with U.S. Department of Homeland Security head Kirstjen Nielsen to discuss migration through Mexico of not just Central Americans but also people from Africa and Asia. Communications and Transportation Secretary Javier Jímenez Espriú joined the press conference this morning and shared the audio from a helicopter carrying opposition power couple Martha Érika Alonso and Rafael Moreno Valle that crashed on Christmas Eve (see Day 25). The complete investigation into the fatal crash, which has been surrounded by rumors of foul play, could take at least a year and a half, Espriú revealed that traffic control at the international airport in the state of Puebla tried to reach the aircraft 11 times before determining the helicopter had disappeared. The helicopter took off from the couple’s garden rather than from an airport. March 1 update: A new Parametría poll published in Milenio found that only 28 percent of Mexicans think crash was accident, while 53 percent think it was deliberate. Of those 53 percent, 20 percent believe think the couple themselves staged the crash and are still alive, 19 percent say it was carried out by political adversaries, 15 percent believe the government had a role, and 27 percent say they don't know. With three months down, a Consulta Mitofsky poll showed that AMLO’s approval has gone up since he was president-elect in November 2018, making him the second-most popular president at the end of his first quarter of the last 30 years after Vicente Fox. The AMLO government has not wavered on its policy of nonintervention (see Day 55) when it comes to the Venezuelan political standoff. And nothing thus far seems to be able to shift López Obrador’s position, whether it’s Switzerland—a country famous for neutrality—recognizing interim Venezuelan interim President Juan Guaidó, pressure from the Trump administration, or warnings that Mexico is on the wrong side of history. So, when news broke Monday night that Univision’s Jorge Ramos and his team had been detained in Caracas’ presidential palace because Nicolás Maduro didn’t like the line of questioning, social media went alight with questions about how the AMLO government would respond to the detention and subsequent deportation of a Mexican citizen. While event were unfolding, Foreign Secretary Marcelo Ebrard took to Twitter to say the Mexican government had expressed its concern and rejection of Maduro’s actions. His secretariat then released a statement expressing similar sentiments and asking the Venezuela government for the return of Ramos’ confiscated reporting materials. But, going by AMLO’s comments this morning, the president sees no shift on the question of how to handle Venezuela’s crisis. While he voiced support for free expression and emphasized that, while the Foreign Secretariat had autonomy and his support, the position of the Mexican government is to avoid a polarizing issue. In related news, the United States is considering whether to sanction U.S.-based billionaire David Martínez, who holds both British and Mexican citizenship, for his commercial ties to sanctioned Venezuelan officials. Days after the murder of a journalist and activist who led opposition to a thermoelectric project in Morelos state, the government held a February 23 and 24 referendum on the initiative (see Day 73). The referendum, or consulta, was the third AMLO’s held to decide the fate of major infrastructure and social projects, but the first since he took office. The prior two took place while he was president-elect. In the first one, nearly 70 percent of participants backed ending an airport megaproject while the second referendum covered 10 initiatives pitched by the incoming government and all of them received nearly 90 percent support or higher. Only 1 percent of voters cast ballots in the first and an even smaller portion did so in the second. The weekend’s survey took place in the three states—Morelos, Puebla, and Tlaxcala—affected by the project, which earned a 60 percent “yes” vote despite boycotts and vandalism of voting booths in some places. Some have raised concerns about the lack of information about referendum results, with little data yet about what portion of voters participated and suggestions that turnout was low. Meanwhile, local opponents of the project, involving two plants and a natural gas pipeline, are concerned a plant in Huexca, Morelos, will contaminate water supplies. The grandson of Mexican revolutionary leader Emiliano Zapata called the consulta a “fraud” and said the battle against the project will continue. The president says UNESCO will evaluate whether the plant’s treatment process is sufficient and that investment dollars are at stake. The AMLO government has suggested it will use citizen referendums to assess support for projects, although the presidency’s spokesman said today he does not see a need for the once-pledged consulta on a reform to create a National Guard, given the Senate’s unanimous vote in support of the legislation (see Day 84). In other news, AMLO this morning congratulated Mexican filmmaker Alfonso Cuarón for winning three Oscars for Roma, although the president revealed he has not yet had time to watch the movie. Mexico’s Senate unanimously approved a constitutional reform to create a National Guard yesterday. How did AMLO’s coalition win the support it needed? By compromising on several measures, but most notably the opposition’s request for the security body to be under civil—rather than military—command. Still, that didn’t stop AMLO from suggesting this morning that the National Guard could have either civil or military leadership, whether active or retired. His exact words: "The faculty for naming the head of the national guard, is with the titulo del ejecutivo (the president). And it could be a civilian or military officer. Retired or active. It’s important to clear that up." The reform will need to be reviewed by the lower house, then needs ratification by a majority of state legislatures before the drafting and approval of secondary laws allowing for its implementation. The version approved by the Senate mandates an initial, five-year transition period during which the roughly 50,000-strong force will be made up of the military and federal police. After that point, the military would return to the barracks. Animal Político’s Arturo Angel offers a helpful rundown (en español) of the reform’s key aspects, from the body’s ability to combat all federal and local crimes to the fact that Guard members who commit crimes would face trial in civilian courts. For the first time since taking office, AMLO held his morning press conference in a location other than the National Palace in the capital. One reason was in celebration of his favorite pastime: the president inaugurated Mexico’s baseball hall of fame in Monterrey today. But the other reason was for AMLO to hold his first meeting with his security team outside of Mexico City in what he said will be the first of other similar sessions around the country to coordinate efforts nationwide. In fact, security has been the topic of the week, given the likelihood that AMLO’s National Guard plan—which supporters say will help stem violence, while critics contend it will deepen militarization—could get a Senate vote in the coming days. On Wednesday morning, López Obrador sought to bolster the former argument by saying the forces will function similarly to UN peacekeeping units. Moreover, though AMLO this week announced the closing of the Islas Marías prison (see Day 81) by saying Mexico needs “more schools, fewer jails,” on Tuesday night the Chamber of Deputies approved a constitutional reform to Article 19 that will expand the number of crimes requiring automatic preventive prison. The president today celebrated the approval of the reform, which must now be ratified by a majority of Mexico’s 32 state legislatures. But opponents consider the measure regressive and say automatic preventive prison doesn’t improve the efficiency of prosecutions in Mexico, where nearly 40 percent of inmates are currently awaiting trial. For example, homicide is already covered in Article 19, yet only 5 percent of homicide cases get solved in Mexico. And another vote is coming up: this weekend, a referendum will take place in three states to determine the fate of a thermoelectric plant (see Day 73). Samir Flores, who led community groups opposing the plant, was murdered at the door of his home this morning. AMLO condemned the crime but said the referendum will proceed. In other news, AMLO today announced that Nadine Gasman, the representative of UN Women in Brazil, will be the new head of Mexico’s National Institute of Women, known as Inmujeres. AMLO’s relationship with the private sector has had its rocky moments and, before the election, some business leaders warned voters casting ballots for him. On Monday, despite existing tensions, the two sides came together in an effort to bridge existing tensions at a meeting of the Mexican Business Council, or the CMN. The group’s leaders warned that recent widespread strikes by factory workers near the U.S.-Mexico border and teachers in the state of Michoacán had an economic cost. Reuters reports that labor strikes in the city of Matamoros, on the Texas border, cost $50 million a day last month. Moreover, strikers have been cutting out the middlemen—meaning current labor leaders they say don’t represent their interests—in this round of protests, spurred by AMLO’s pledge to support independent unions and improve conditions, reports the Guardian. The meeting with the CMN came after López Obrador, with business leaders such as Mexican tycoon Carlos Slim in attendance, inaugurated an investment council under Chief of Staff Alfonso Romo’s leadership. “Public, private, and foreign investment is required. We need investment to take growth from 2 percent to 4 percent,” said Romo of the new agency, which he said will focus on innovation and new technologies. In other news, on Monday, AMLO clarified his goals for Islas Marías, where a penal colony has operated about 100 miles off the Pacific coast since 1905. The prison will be converted into an arts and environmental studies center and some 200 of 856 prisoners incarcerated there will be freed while others will be relocated to prisons closer to their homes. AMLO called the prison an “icon of repression,” though it stands among Mexico’s highest rated penitentiaries by the country’s human rights commission due to its humanistic approach and success with reinsertion. But AMLO could see legislative gains overall thanks to new fractures in one of the major opposition parties. On Tuesday, Ricardo Gallardo, the head of the left-wing Party of the Democratic Revolution (PRD) in the lower house, along with eight other PRD deputies, quit their party. The PRD, of which AMLO was a member until forming MORENA, has made alliances across the aisle as it’s seen its power diminish, leading Gallardo to describe the PRD as “confused.” Eight of the legislators said they will remain independent, while one is joining MORENA. The move comes after another PRD legislator faced expulsion for voting with MORENA in favor of the National Guard plan. The PRD will now have just 10 out of 500 seats in the Chamber of Deputies. Proceso reports that, should the nine legislators side with the governing party on legislative matters, MORENA will have the needed two-thirds majority—or 335 out of 500 seats—to usher through constitutional reforms in the lower house. On Friday, AMLO’s administration announced plans to boost investment in Pemex that involve cutting taxes and refinancing the state oil company’s debt. Pemex’s Chief Financial Officer Alberto Velázquez García said the government will increase investments to $14.9 billion in 2019, a 36 percent jump from 2018. The government will also expand tax breaks to $775 million annually for a total of $4.7 billion through 2024. But investors are unimpressed with the short-term fix to Latin America’s most indebted national oil company, which holds about $107 billion in financial debt and is scheduled to make a $5.3 billion payment by the end of May. “Wall Street was looking for double that amount in fiscal relief,” John Padilla, a partner at energy consulting firm IPD Latin America, told Bloomberg. In a same-day statement, Fitch, the ratings agency that in January downgraded the company’s credit outlook to just above junk status (see Day 60), said the measure does not change the agency’s negative outlook for Pemex. During his morning press conference, the Mexican president also mentioned that his government could “take more action if needed” to keep the oil company’s finances healthy and avoid acquiring more debt. Elizabeth Gonzalez wrote this Day 77 update. The White House will declare a national emergency at the U.S.-Mexico border, U.S. Senate Majority Leader Mitch McConnell revealed on Thursday while announcing that, to avoid a government shutdown, he would not oppose the plan. That means Trump, who suggested in the past that Mexico would pay for a border wall, could go around Congress to fund the project. But, in recent weeks, the two governments have been working together in some capacity on the White House’s “Remain in Mexico” policy, which has seen Central American migrants seeking U.S. asylum sent back to Tijuana to wait out their immigration processes. On Wednesday, the United States sent back families seeking asylum for the first time. In other news, Napoleon Gómez Urrutia, a mine union leader and senator for AMLO’s MORENA party, yesterday announced a new labor federation made up of 150 unions. Gómez Urrutia, who previously lived in self-imposed exile in Canada due to facing embezzlement accusations, said that recent walkouts from maquiladora plants near the northern border could inspire other strikes and that the federation would support them. Also, on Thursday, AMLO lashed out at what he called the "mafia of science" after two people appointed to leading posts in Mexico's science and technology agency were forced to step down following a backlash over whether they had adequate qualifications. And amid concerns about state oil firm Pemex’s financial health (see Day 76), AMLO pledged on Thursday that the company will make all its debt payments. Fitch’s January decision to downgrade Pemex (see Day 61) appears to be getting investors worried. More than two-thirds of participants in a February Bank of America client survey think Mexico will lose its investment grade, marking a jump from 41 percent last month. The largest portion believe the downgrade will take place in 2021. One of the steps that raised investors’ eyebrows was AMLO’s moves to cancel an airport megaproject. News came out Wednesday that the government-run airport agency had negotiated a deal to pay out $1.77 billion to bondholders for the incomplete airport. In other news, AMLO said on February 12 that he would ask Congress to pass legislation preventing officials from serving in the private sector for 10 years after leaving their posts. The goal, he says, is to prevent conflicts of interests in the case that public servants end up working in sectors related to their government posts. From the fuel theft battle to pledges of new refineries, energy lies at the heart of a large portion of AMLO’s policy steps. Today was no different as attention turned to Mexico’s national electric commission, known as the CFE. “We are going to stop this perverse plan of destroying CFE so private companies can take over the electricity market,” the president said during his morning press conference, where CFE head Manuel Bartlett announced the revision of private-sector contracts. In particular, the president highlighted contracts with companies for seven natural gas pipelines that remain unfinished and are being built to supply power plants. The president suggested that companies would be invited to review and renegotiate contracts with the goal of keeping electric bills low, but Bartlett didn’t rule out the possibility that the firms could face lawsuits. The presidency also identified a number of past officials, including President Felipe Calderón (2006–2012), as bearing responsibility for and potentially benefitting from the CFE’s increasing privatization. In addition, over the weekend López Obrador announced the first consulta, or referendum, scheduled to take place since he took office. This one, slated for February 23–24, will decide the fate of a thermoelectric plant, with the votes taking place in the affected states of Morelos, Puebla, and Tlaxcala. AMLO held two consultas—one for an airport project and another for 10 initiatives—prior to becoming president. In both cases, participants overwhelmingly backed his proposals. Speaking of airports, AMLO appears to be considering new options to solve the problem of the over-capacity airport in the capital, even after an aforementioned consulta resulted in the cancellation of an airport megaproject. On Sunday, he suggested building an airport in the nearby state of Hidalgo and the construction of another runway at the underused Toluca airport in Estado de México. He also said a new terminal would be constructed at Mexico City’s current airport, in addition to improvements. In Montevideo on Thursday, Uruguay signed, along with eight European countries and two other Latin American countries, a statement calling for new presidential elections in Venezuela. Mexico, which partnered with Uruguay to hold this week’s summit, stood by its nonintervention policy (see Day 55) and did not. Even as Mexico dug in its heels on the stance, an El Financiero poll found that, out of six areas on which respondents had to judge the new president, AMLO’s posture on Venezuela has the lowest level of support. Still, more than half of Mexicans back AMLO on it. Moreover, the new poll found that AMLO’s approval ratings overall, boosted by support for his battle against fuel theft (see Day 46), reached a new high of 86 percent as he began his third month in office. AMLO announced changes to funds for childcare during his morning meeting, saying that a bimonthly payment of roughly $83 would go to directly to parents rather than to daycare centers. One reason for the change, says the president, is that there are signs of past corruption in the distribution of social development funds, not just in terms of daycare, but also to rural organizations and programs for the elderly. The move comes the morning after Finance Secretary Carlos Urzúa caused a stir when he previewed the change, saying it would allow parents to manage spending on childcare, “including giving [the funds] to grandmothers, because surely they will take better care of the children.” Critics contended that the comments amounted to a lack of awareness about gender equity. Mexico has a huge gender gap in its labor force, given that only four in 10 women work outside the home. On the topic of children, AMLO’s daily press conference drew attention today for the presence of two child journalists from Radio Aventureros. One asked about the president’s proposals to avoid brain drain, to which López Obrador responded that there would be improved scholarships for graduate and doctoral studies to keep young scholars from leaving the country. In other news, as indicated on Day 60, AMLO’s cabinet members are facing pressure to declare assets amid the government’s focus on cracking down on corruption. Controversy arose yesterday over news that Interior Secretary Olga Sánchez Cordero and her husband co-own a penthouse in Houston and whether she had appropriately disclosed the information. Also out today: inflation figures, and they’re at their lowest levels since December 2016. Consumer confidence moderated, however, growing by 1.6 percent in January compared to 13.6 percent in December. Today marks the 102nd anniversary of Mexico’s 1917 Constitution. During an event in Querétaro, AMLO described the document as full of patches due to the quantity of reforms it’s seen and that, while his government will not undertake the task, future generations should consider creating a new Constitution. Indeed, it’s been reformed more than 700 times with the majority of changes taking place under the prior six presidents. For his part, AMLO said his government’s reforms will focus on ending corruption, battling impunity, and defending democracy. And, with Mexico’s Congress back in session starting February 1, several reforms are coming down the pike for debate. Lawmakers will consider measures such as the creation of a National Guard, restrictions on foreign investment in certain sectors, and legislation that will expand—from six to 19—the types of crimes allowing for preventative prison for suspects. What’s one of the first items on the extensive congressional agenda? The possible cancelation of the prior government’s education reform (see Day 12), which is slated to be taken up on February 6. AMLO’s Monday morning press conference involved the unveiling of a plan to find Mexico’s thousands of desaparecidos, or people who have gone missing since the 2006 start of the country’s offensive against organized crime groups. With some 40,000 people disappeared, the Undersecretary of Human Rights at the Interior Secretariat Alejandro Encinas called Mexico “one big hidden mass grave.” The administration says it will allot some $20 million and seek help from international institutions such as the UN and Red Cross to battle disappearances and identify roughly 26,000 bodies. In many cases, families of the disappeared have had to lead efforts to uncover hidden graves and seek out their loved ones. Encinas said a majority of the missing are youths between the ages of 17 and 29 and that as many as 10 percent are migrants. While a flurry of European countries formally recognized Venezuela’s interim President Juan Guaidó on Monday, Mexico’s Foreign Secretary Marcelo Ebrard prepared to lead a delegation to Uruguay for talks to be held Tuesday and Wednesday with the goal of building dialogue to solve Caracas’ political standoff. Guaidó has rejected the talks, saying that, “To be neutral is to be on the side of a regime that has condemned hundreds of thousands of human beings to misery, hunger, exile and even death.” Learn more about Mexico's foreign policy approach under the new government. Since López Obrador took office—and even before, if we consider a pre-inauguration move to end a massive airport project—there’s been no lack of disruptive events. From a battle against fuel theft that disrupted gasoline supplies in some states to a controversial National Guard plan to the slashing of public-sector salaries, the AMLO presidency has shepherded in a series of major policy shifts. As Americas Quarterly Editor-in-Chief Brian Winter pointed out while moderating a January 31 panel, AMLO rode to electoral victory on a wave of discontent and demand for change. And, as panelist Carlos Bravo Regidor of CIDE said, change can be messy. Through it all, AMLO has kept up his high approval ratings. So, between a majority control of Congress and solid support, does a counterweight exist? Writing in El Universal, pollster Jorge Buendía suggests public opinion has a role to play, given that of the roughly 70 percent of Mexicans who back AMLO, half count as core support. The other half is made up of people waiting to see whether he delivers on concerns such as the economy, violence, and anti-corruption efforts. While there will be some pressure on the presidency in the first year, he writes, the major challenge will be in the second and third—prior to Mexico’s mid-term elections. Do AMLO and his political party face any other challengers? January 31 panelists Bravo Regidor and Valeria Moy of México ¿Cómo Vamos? named Jalisco Governor Enrique Alfaro as one potential form of opposition, while McLarty Associates’ Jorge Guajardo suggested a new party headed by ex-President Felipe Calderón and his wife and former candidate Margarita Zavala could be another. But Calderón and Zavala are not the only ones starting a new party. Gabriel Quadri, who ran for president in 2012 but only pulled in just over 2 percent of votes, hopes to do the same. Former Jalisco legislator Pedro Kumamoto, an independent seen as a rising political star who lost a 2018 bid for a Senate seat, seeks to do the same in his state. Following Tuesday’s news that Fitch had downgraded Pemex (see Day 60) two notches, AMLO attacked the ratings agency for being hypocritical and asserted that the state oil firm “is better than it’s been in 30 years because Pemex’s principal problem was corruption and it’s being washed of corruption.” Pemex has the highest levels of financial debt of any state oil company in Latin America while its crude production has been declining since 2004. Juan Pablo Castañón, head of one of Mexico’s most prominent business associations, warned the downgrade could contaminate the economy. López Obrador also played host to Spain’s President of Government Pedro Sánchez, marking the first visit by a head of state since inauguration. While with Sánchez, AMLO said he will not regulate or reduce bank fees for the next three years, despite the fact that his party has suggested it would present such legislation in Congress. The potential move previously drew investor concern. AMLO also said that, on the subject of Venezuela’s political standoff, Spain and Mexico agree on the need for dialogue, although Spain is among EU countries that have given Nicolás Maduro a deadline to call elections (see Day 59) while López Obrador says talks should not have any preconditions. Mexico's Foreign Secretariat also announced that, in partnership with Uruguay, it will cohost an international conference on February 7 about the situation in Venezuela for countries that share its position of nonintervention. A deadline is coming up fast for some of Mexico’s cabinet members: they have until January 30 to declare their assets. Although there is no legal obligation to do so, AMLO, who pledged to take on corruption while on the campaign trail, announced earlier this month that federal officials must declare their assets if they want to keep their posts. Two secretaries—Interior Secretary Olga Sánchez Cordero and Environmental Secretary Josefa González Blanco—have yet to do so. On Tuesday, AMLO said his administration will trim Pemex’s tax burden in the hopes of boosting oil production. This came on the heels of a Monday night announcement by the Finance Secretariat that the government will raise Pemex’s limit on deductions for costs linked to extraction and exploration, thereby freeing up some $578 billion a year through 2024 for capital expenditures. Still, Pemex bonds took a hit January 29 due to fears the state oil firm could lose its investment-grade status. Same-day update: Later on Tuesday, Fitch Ratings downgraded Pemex from BBB+ to BBB- with a negative outlook. While the U.S. Homeland Security Secretary Kirstjen Nielsen toured the San Diego port of entry on Tuesday, Mexico continued to clarify what concessions it would make in the face of Washington’s Remain in Mexico plan (see Day 59). Per the country’s immigration agency, Mexico will accept asylum seekers waiting for U.S. processing who are age 18 to 60 from the Northern Triangle countries and will grant them four-month work visas. Moreover, they will only be accepted in Tijuana. Today, a Honduran asylum seeker was the first to be sent back under the plan. Last week AMLO submitted a proposal to Congress that would allow Mexico’s pension funds—known as Afores—to invest in diverse assets and private equity funds. Now, reports Bloomberg, some observers worry that the president will steer the funds toward government infrastructure projects, such as the Maya Train in the Yucatán Peninsula or a refinery in his home state of Tabasco. The AMLO government is asking publishers to lower book prices as a way to promote reading. In Chilango, writer Gabriel Rodríguez Liceaga says the problem isn’t the cost but rather a failure to promote a love of reading—or spaces to read. So what’s AMLO reading? Americas Quarterly’s Benjamin Russell take a look at the president’s reading list. The question is whether Mexico will hear him. López Obrador’s government has reverted to a noninterventionist foreign policy (see Day 38) and AMLO said on Friday that Mexico would be willing to serve as an intermediary in negotiations between Guaidó and Maduro. On Saturday France, Germany, Portugal, Spain, and the UK gave Maduro an ultimatum to hold elections or they’d also recognize Guaidó. Despite growing international pressure on Maduro, AMLO reiterated on Monday that Mexico’s posture had not changed. CIDE’s Carlos Bravo Regidor, who will participate in an AS/COA panel on January 31, noted on Twitter that seeking to serve as an intermediary is not the same as remaining neutral. In Excelsior, columnist Leo Zuckermann writes that Mexico’s decision not to go the same way as the rest of the Lima Group in recognizing Guaidó means it will find itself on the wrong side of history. Tensions don’t just exist at the U.S.-Mexico border, however. On Sunday, some 300 people in Guatemala attacked and drove a group of migrants to the Mexican border to seek refuge. Argentina, Brazil, Chile, Colombia, Ecuador, and Peru. These are some of the Latin American countries that joined the United States in recognizing opposition leader Juan Guaidó as Venezuela's interim president after he took an oath swearing himself into that role on January 23. But there was a notable absence among Lima Group members opting to back Guaidó: Mexico. The Mexican decision not to outright reject Nicolás Maduro comes as little surprise, given the AMLO government's shift back to following a past policy of nonintervention enshrined in the Estrada Doctrine (see Day 38). “It’s not that we’re in favor or against. We’re following through with our institutional principles,” AMLO said in his Thursday morning press conference, following his foreign secretary’s assertion that Mexico will not break ties with the Maduro government. Earlier this month, Mexico didn't sign a January 4 Lima Group statement in which member countries said they would no longer recognize Maduro following his January 10 inauguration to start a new presidential term. Maduro claimed victory in a 2018 election widely seen as rigged. After the AMLO government said it would not sign the statement because doing so would be intervening in Venezuela's internal affairs, Maduro said "¡Viva Mexico!" during his inauguration when thanking supportive countries. On Wednesday, while dramatic events unfolded in Venezuela amid protests that left at least 16 dead, Mexico's foreign secretariat released a statement saying it would continue to recognize the Maduro government, as well as issuing another in partnership with Uruguay (see below) urging peaceful resolution to the current crisis. However, Mexico's main opposition—the National Action Party, or PAN—announced that it would back Guaidó. The death toll in the pipeline explosion (see Day 50) in the Mexican town of Tlahuelilpan has risen to 94, per Hidalgo Governor Omar Fayad, and roughly 50 people remain hospitalized. At least 70 people are missing, and most of them are thought to be dead, with many of the recovered bodies yet to be identified. Reuters, which calculates that thieves siphon the equivalent of one-fifth of national gasoline consumption a day, reports that as many as 800 people had turned up at the punctured pipeline to collect gasoline amid shortages sparked by the government’s crackdown on fuel theft, or huachicoleo. Mexico’s new attorney general (also Day 50), Alejandro Gertz Manero, announced plans to summon soldiers, federal police, Pemex workers, and government officials to testify and determine who tapped the pipeline and to get a handle on the tragedy’s timeline. Although video footage shows members of Mexico’s military present before the explosion, reports indicate they were outnumbered and even threatened. A few days earlier, people stealing fuel in another town beat soldiers who tried to stop them. In a column for Reforma, political scientist Genaro Lozano describes Tlahuelilpan as a breaking point that requires Mexico to consider the dilemma of how the Armed Forces can protect people without using repressive tactics, particularly as the Senate debates a constitutional reform to create a National Guard (see Day 48). López Obrador repeated that he will not end his battle against fuel theft, which involves shutting down pipelines targeted by organized crime groups. In a Tuesday morning press conference, he announced social programs in 91 municipalities affected by huachicoleo. A day earlier, he said that Mexico is buying 571 tanker trucks from abroad to the tune of $85 million in an attempt to stabilize gasoline supply affected by pipeline shutdowns. AMLO also said that the disaster in Tlahuelilpan would not have occurred in the absence of corruption. But Proceso found that senior Pemex officials selected by the new government have ties to major scandals, including the Odebrecht scandal engulfing several Latin American countries. In other news, the International Monetary Fund trimmed its growth forecast for Mexico by 0.4 percent to 2.1 percent growth in 2019 and by 0.5 percent the following year for 2.2 percent growth in 2020, with a decrease in private investment as the cause. During the evening of January 18, a terrible accident took place. An explosion at a tapped gas pipeline in the state of Hidalgo claimed at least 66 lives and left dozens injured. Footage shot earlier in the day showed crowds of people filling containers at the site of the rupture, despite the presence of soldiers. A pipeline explosion at the site of another tapped pipeline occurred the same night in the neighboring state of Querétaro, although there have not been reports of injuries in that location. The incidents happened in the middle of López Obrador’s fight against fuel theft, or huachicoleo (see Day 40 and Day 46). In a press conference this morning, AMLO said the tragedy would not change his strategy as it proved the need to eradicate huachicoleo completely. Also on Friday evening, Mexico filled its attorney general slot. The Senate selected—with 91 votes in favor—and swore in Alejandro Gertz Manero, 79, to the nine-year term. Gertz Manero, who’s been a security advisor to AMLO, has held several government roles stretching back to the 1970s, including in the government of Presidente Vicente Fox and as Mexico City police chief. Civil society groups and some opposition members have raised concerns that, due to his proximity to the president and a lack of transparency in the selection process, Gertz Manero will not be autonomous. The president’s proposal to create a 60,000-strong National Guard won approval in the Chamber of Deputies last night. The legislation surpassed the two-thirds required support for a constitutional reform, winning 362 votes in favor and 119 against. The coalition of MORENA, AMLO’s party, accounted for a sizeable portion of the votes, but the opposition Institutional Revolutionary Party (PRI) came on board to give the measure a resounding victory. While running for office, AMLO pledged to pull the military off the streets but changed his tune since his electoral victory. When the measure was introduced to the lower house in December, Tatiana Clouthier, who served as AMLO campaign manager, said she didn’t want the military policing the country and questioned whether her fellow MORENA lawmakers would back the National Guard plan if another president had pitched it. The vote was pushed back to January, in part for legislators to hear opinions from experts, officials, civil society, and international NGOs. Some modifications were made to the legislation, such as the National Guard having a civil command rather than a military one. Although Clouthier urged other changes, in the end she abstained from voting rather than casting a “no” ballot. But it turns out AMLO isn’t satisfied with the legislation as approved by the Chamber either. During his January 17 press conference he urged the Senate, where the legislation also needs and is expected to win a two-thirds vote, to reintegrate a measure that would allow the Army and Marines to handle security while the National Guard is formed. After the Senate approves the reform, it must then be ratified by a majority of state legislatures. AMLO’s party controls the legislatures in more than half of Mexican states. After that, Congress will need to approve three implementing laws. In other news, Mexico’s Senate yesterday approved a list of 10 candidates to be considered for the role of attorney general of Mexico. At least three are seen as close to AMLO, raising concerns that Mexico will end up with what’s referred to as a fiscal carnal meaning the top prosecutor would not be truly independent. Senators from the opposition National Action Party (PAN) rejected the list, saying it failed to guarantee the next attorney general’s autonomy. AMLO said he will send a narrowed list to the upper house today for selection of the person who will next hold the post. Also, after Mexico faced criticism for not signing a Lima Group statement condemning Venezuelan leader Nicolás Maduro (see Day 38), the Foreign Relations Secretariat’s Maximiliano Reyes Zúñiga said Monday that his country is willing to play a mediating role in crises in Venezuela and Nicaragua. For all the worries, memes, and viral videos about the gas shortages, most Mexicans back the president taking steps to combat fuel theft. One reason may well be a hunger for accountability. On Monday, the head of the finance secretariat’s intelligence unit, Santiago Nieto, indicated some $527 million worth of laundered cash related to sale of stolen fuel had been detected. Nieto also said five cases—involving businessmen, public officials, and an officer from state oil firm Pemex—have been sent before the attorney general’s office. The chart below looks at support for AMLO’s steps against huachicoleo, which shows that more Mexicans are likely to blame his predecessor than the thieves for the shortages, per Grupo Reforma. Moreover, the president’s approval rating has only gone up since the onset of gas shortages, according to El Financiero. In the United States, all eyes might have been on Donald Trump’s much-hyped “border crisis” address but, in Mexico City, people weren’t paying much attention. That’s because steps taken by the AMLO government to stem fuel theft led to fuel shortages in other parts of the country and the problem reached the capital yesterday. People took to Twitter to share images showing the impact of panic buying, such as blocks-long lines at gas stations tagged with #NoHayGasolina (“There’s no gasoline”). Fuel theft, referred to locally as huachicoleo and often carried out by organized crime groups, is no small problem, with state oil firm Pemex robbed of roughly $3 billion worth of fuel last year alone. One way the AMLO government is trying to tackle the problem is by shifting fuel transportation from frequently tapped pipelines to tankers and trains. But the move comes at a time of year when demand runs high and inventory low. The government also deployed members of the armed forces to monitor operations at refineries, distribution terminals and networks, pumping stations, and a control center, as Natural Gas Intelligence’s Christopher Lenton reports. In a Twitter thread analyzing AMLO’s anti-huachicoleo strategy, energy expert Gonzalo Monroy says the measures are short-term and that, when the soldiers leave and distribution returns to pipelines, “the perpetual game of cat and mouse” will restart. In his January 9 press conference, the president urged people not to engage in panic-buying of gasoline while the government seeks to normalize distribution. And, as far as Trump and the border go, AMLO said he didn’t want to meddle in Washington’s internal affairs. “We have to take into consideration that there’s a political confrontation taking place in the United States, just as there is in all countries every time elections near,” he said, referring to the U.S. presidential vote in 2020. In recent days, AMLO unveiled a plan to slash taxes and double the minimum wage in Mexico’s border region, partially with the goal of stemming emigration. The new Mexican government has taken a big foreign policy step. Or rather, it didn’t take one: Mexico declined to sign a January 4 Lima Group statement in which 13 Latin American countries announced that, due to the rigged nature of Venezuela’s 2018 election, they will not recognize Nicolás Maduro as president when he’s inaugurated for a new term on January 10. During his Monday morning press conference, López Obrador said the decision to abstain from signing on was less about being sympathetic to Maduro and more about a return to Mexico’s principle of noninterventionism in foreign policy. From the 1930s until early this century, Mexico followed the Estrada Doctrine, named for Foreign Secretary Genaro Estrada (1930–1932), which dictated that Mexico should neither support nor reject governments or government transitions because doing so would violate state sovereignty. The doctrine also backs a peaceful resolution to conflicts. In Nexos, ITAM Professor Natalia Saltalamacchia writes that the move not only returns Mexico to policy of yore but also places it in the delicate position of wanting to avoid supporting the Maduro regime but also not create conditions for a military intervention in Caracas. In a speech to the Lima Group, Mexico’s Undersecretary for Latin America and the Caribbean Maximiliano Reyes echoed this balancing act, calling for dialogue as a resolution to Venezuela’s crisis. If the shift reflects a return to past policy, it also represents a departure from the active role Mexico’s prior government played in pushing, both in the Lima Group and the OAS, for the restoration of democratic norms in Venezuela. And, in the face of Venezuela’s humanitarian crisis, many lamented the step back. In Excelsior, Ricardo Pascoe writes that the Estrada Doctrine was a policy that applied to another point in Mexico’s history and that following this approach in the case of Venezuela is “covering one’s eyes to reality.” Similarly, in El Universal, journalist León Krauze compares AMLO to a “diplomatic ostrich,” adding that, by diminishing Mexico’s global leadership in this case, his government will find itself weakened when it needs to defend Mexican interests in the United States. Mexico’s abstention from the January 4 statement also fuels concerns that some members of the AMLO government are too sympathetic to the Maduro regime, particularly among critics who compare the president to the now deceased Venezuelan strongman Hugo Chávez. This morning, López Obrador downplayed any connection with Maduro, saying the first time he ever met him was at his December 1 inauguration. The fact that Mexico invited Maduro launched a #MaduroNoEresBienvenido (“Maduro, you’re not welcome”) movement on social media and shouts from the opposition of “dictator” in the congressional chamber during the ceremony. During this morning’s press conference, López Obrador stood before a chart that mapped a decline in homicides over the course of his first month in office, even as he indicated that the numbers don’t yet reflect the total for the entirety of December. Why show incomplete numbers? AMLO was responding to the prior day’s front cover of Reforma, which reported that executions tied to organized crime increased by 65 percent from November to December in 2018. As journalist Javier Garza Ramos covered in a Twitter thread, a number of analysts and security experts questioned the Reforma tally, raising doubts about measuring executions rather than murders overall, questioning how the outlet arrived at the number when official figures weren’t yet out for the month, and why it’s problematic to make comparisons from one month to the next rather than year on year. The Reforma report taps into a major worry, with an El Financiero poll showing that the largest portion of Mexicans described insecurity as the biggest problem in 2018. (See more about how Mexicans viewed last year in the tweet below by pollster Alejandro Moreno.) It’s no wonder, given that Mexico lodged the highest number of homicides ever recorded and murder rates rose in 27 out of 32 states last year. For his part, AMLO referred to Reforma as “fifí” (elitist), a term he often uses for media organizations that criticize him. Journalist Ezra Shabot cautions that using such language contributes to polarization and legitimizes violence, “independently of whether or not AMLO condemns the use of force against his adversaries.” Mexico is among the deadliest countries in the world for journalists. In other news, AMLO announced that he will publicly declare his assets on January 4 and called on all public servants working in his government to do the same. Construction of the terminated airport project in Texcoco has officially ended. Supreme Court ministers elected Arturo Zaldívar as the body’s new president, and Nación321 looks at his opinions on everything from LGBTQ rights to literature. Mexico rang in 2019 by marking two milestones: the twenty-fifth anniversary of the implementation of NAFTA, as well as that of the Zapatista guerilla uprising in the poor and largely indigenous southern state of Chiapas. On January 1, 1994, the Zapatista Army of National Liberation, or EZLN, brought its demands for Mayan indigenous rights to the streets of San Cristobal de las Casas and drew global attention to its calls for autonomy. Now, with a leftist holding the presidential office, the EZLN started the year voicing opposition to some of AMLO’s proposals, including the yet-to-be approved National Guard (see Day 21) and the Maya Train—the latter of which the group said it will not allow to be constructed. During his first press conference of the year, López Obrador responded by saying he has no conflict with the EZLN or its leadership, saying: “We won’t fall for any type of provocation,” and calling for “peace and love.” He also doubled down on his National Guard plan, calling on youth to sign up with the goal of recruiting 50,000 people for the force by 2021. In other news, Mexicans started the year fretting about gas price increases, despite the fact that AMLO pledged to end such price hikes, known as gasolinazos. Finance Secretary Carlos Urzúa has stated that increases reflect inflation. The first Nochebuena of the AMLO presidency coincided with tragedy when a helicopter carrying the governor of Puebla state, Martha Erika Alonso, and her husband, Rafael Moreno Valle, crashed on Christmas Eve. All five people on board died. Together, the wife and husband formed a political power couple and were prominent leaders in the right-leaning opposition National Action Party. Moreno Valle, a senator and a former Puebla governor who came from a political family, saw his name floated as a potential presidential candidate for both the most recent election in 2018 and the next race in 2024. For her part, Alonso saw her win confirmed by the top electoral court as recently as December 8, more than five months after the election. She narrowly beat the governing MORENA party’s Miguel Barbosa, who alleged that widespread voting irregularities took place. AMLO called the court’s decision “undemocratic.” Puebla’s first woman governor took office on December 14, just10 days before her death. This marked the fifth occasion since 2005 that an aircraft accident killed a top Mexican official. The frequency has led many in Mexicans to suspect foul play over mechanical failure in such cases, and rumors swirled—particularly on social media—on December 24. On Christmas Day, Public Security Secretary Alfonso Durazo announced that no explosives were found in the wreckage and that Canadian and European experts will participate in the investigation, given that the helicopter was Canadian with an Italian engine. The president expressed his condolences to the families of Alonso and Moreno Valle. He did not attend the December 25 memorial service, sending his interior secretary to represent him. Puebla’s Constitution dictates that the state legislature select an interim governor and call special elections. Until lawmakers do so, Jesús Rodríguez Almeida, the secretary general of government, will hold the role. In other news, on the evening of December 21, lawmakers pushed the vote on whether to approve the National Guard (see Day 21) until January. Get ready for another referendum. López Obrador announced that next month his government will present a plan for a real estate development project on land owned by the military in Mexico City’s upmarket Santa Fe neighborhood. Income generated would fund the National Guard. The proposal, said AMLO at his morning press conference, would then be voted on by the public in a consulta, just as his airport plan and a number of social programs were before he took office. The National Guard plan itself is not without controversy. On the campaign trail, AMLO promised to end 12 years of reliance on the military policing and return troops to the barracks. Over that period, more than 200,00 have died and another 35,000 have gone missing. But López Obrador changed his tune since the election, unveiling a plan to create a 50,000-strong National Guard that critics say will lead to entrenched militarization. His proposal requires constitutional changes to regulate the force, although the governing party modified legislation to win over the opposition, including, as Americas Quarterly’s Benjamin Russell writes, a five-year limit on military authority overseeing the National Guard. The legislation has made its way through committee and faces the obstacle of winning two-thirds approval in a vote expected in the coming days. The AMLO government says the body is necessary because civilian police forces are ill-prepared or corrupt. But, writing in The Washington Post, Cornell University’s Gustavo A. Flores-Macías echoes opponents’ concerns that militarization leads to more violence. “Here’s why: the military relies on high-impact weapons and tactics meant to overwhelm and destroy an enemy rather than de-escalate threats to citizen security,” he says. “Soldiers are generally trained with that purpose in mind, not a serve-and-protect mentality that is mindful of human rights and civil liberties.” Prominent lawyer Roberto Hernández today shared a graphic showing the high rates of abuse of those detained by police and military forces in Mexico. The Washington Post's Kevin Sieff says the Mexican government was only informed of the plan an hour before Nielsen made it public and, as The Huffington Post's Roque Planas tweeted, much remains unclear about the logistics behind the DHS announcement. But it comes on the heels of news of joint U.S.-Mexico development cooperation for southern Mexico and the Northern Triangle earlier this week (see Day 19). The DHS plan has already been blasted by human rights groups such as Amnesty International, which called it a “violation of international law” that “could prove deadly to vulnerable families.” For more on the complexities of immigration policy moves such as this one, listen to our podcast with UT Austin’s Mexican migration policy expert Stephanie Leutert. Moreover, it’s not clear Mexico is prepared to absorb those whose petitions are refused by Washington. While the number of asylum seekers in Mexico rose 1,143 percent from 2014 to 2018, AMLO’s proposed 2019 economic package (see Day 17) gives the agency charged with processing asylum claims its smallest budget in seven years. In other news, Mexico City’s Texcoco airport project is one step closer to the dustbin. On Wednesday evening, the Finance Secretariat announced that a majority of bondholders had accepted a buyback offer for the canceled megaproject. In his Thursday morning presser, AMLO said the deal clears the way to get going on his alternative airport expansion plan at the Santa Lucía military base. *Editor's note: The Foreign Affairs Secretariat spokesman's name is Roberto Velasco. An earlier version of this post indicated his last name was Velásquez. López Obrador admitted his administration made a mistake. At his morning press conference, he said that about 4 percent of spending would get trimmed from operational costs for the presidency and secretariats to boost funding for public universities. The move follows outrage over budget cuts to those universities in the economic package submitted to Congress over the weekend (see Day 17). On Tuesday, Foreign Secretary Marcelo Ebrard announced a joint U.S.-Mexico agreement to mitigate migration to the United States. Per a press release on the State Department website, Washington will commit $5.8 billion to back institutional reforms, economic growth, and development in the Northern Triangle countries of El Salvador, Guatemala, and Honduras. The United States also committed $4.8 billion in public and private investment in Mexico, with $2 billion focused on projects in the country’s poorer southern regions. Mexico, for its part, pledged $25 billion to development in the southern part of its country over a five-year period. With this cooperation understanding, which was likely broached as a topic during AMLO’s call last week (see Day 13) with Trump, the Mexican president hopes to make progress on his campaign pledge that migration should be something people choose rather than a step they’re forces to make. “This appears to be a very positive step,” said Ebrard on December 18. But some observers note that the deal repackages current U.S. aid and loans that don’t attack the root causes of emigration. Day 17: December 17 – Who gets cuts and who sees gains in the 2019 budget? Monday got off to a positive start for the peso in the wake of Finance Secretary Carlos Urzúa submitting the 2019 budget to Mexico’s lower house of Congress on December 15. The $287 billion austerity package seeks to redirect funding toward infrastructure and social development, with a particular focus on programs for youth and the elderly. The budget predicts GDP growth of 2 percent next year, as well as a primary surplus of 1 percent. Most government secretariats will see cuts, with the environmental one taking a hit of 29 percent, while energy and labor will see tenfold increases. Given blowback over funding cuts for public universities, Subsecretary of Finance Arturo Herrera indicated that could be an area of modification in the budget. The Mexican Congress has until New Year’s Eve to approve the package, though the okay could come as soon as this week. In other news, on December 17, AMLO is expected to announce a 14 percent increase in Mexico’s minimum wage, bringing it from about $4.38 to $5.07 per day, as well as a higher amount—about $8.76 per day—for the northern border region. Mexico has one of the lowest minimum wages in Latin America. Over the weekend, López Obrador held a ritual in Chiapas to ask Mother Earth’s permission to build the Maya Train through the country’s southeastern region. Critics say the project’s construction will take place without sufficient environmental impact studies or appropriate consultation with local indigenous groups. During his Wednesday press conference, AMLO reportedly skipped the Q&A session with journalists to take a phone call. AMLO leaves morning news conference w/o taking questions -- a first since he started speaking w/ media in mornings last week. Said he needs to take an important phone call. When shouting reporters asked if it's @realDonaldTrump, says "I'll tell you later." It appears the call may indeed have been with his U.S. counterpart, marking his first with Trump since the inauguration. López Obrador tweeted that night that the conversation was “respectful and friendly” and involved negotiating a joint development program for Central America in the hopes of stemming migration. In his Thursday morning press conference, AMLO said he is considering including $5 billion in Mexico’s 2019 budget to create jobs in Central America and Mexico so that people don’t “need to migrate.” He also mentioned that Trump invited him to visit Washington, although he indicated that the visit would need to have a purpose, with hammering out a migration deal being the likely subject. López Obrador also said one topic the two leaders didn’t discuss was the matter of who will pay for the wall. On Thursday, Trump tweeted that the recently inked USMCA deal—the renegotiated NAFTA—will save so much money that it can be considered Mexico’s payment for the wall. Update on the airport bonds (see Day 12 for more): bondholders rejected the AMLO government’s latest buyback proposal for the capital’s canceled airport project. In what will come as little surprise to those paying attention to pre- and post-election pledges, López Obrador on Wednesday signed an initiative to shelve his predecessor's education reform. "Promise delivered, teachers of Mexico," he said. The move, which will please Mexico's powerful teachers unions, will eliminate the Institute for Educational Evaluation and, with it, a key component of the reform requiring teachers to take evaluation exams. Supporters of the reform said the exams would create greater accountability in a system seen as rife with corruption, from phantom teachers to inherited posts. Elba Esther Gordillo, the head of Latin America’s largest labor union, was released in August despite facing charges for embezzling more than $150 million from her own 1.5-million strong National Education Workers’ Union. On the other hand, critics said the evaluations didn't take into account challenges faced by teachers in poorer parts of Mexico and that the government fell short on and even cut funding for teacher training. AMLO's plan to end the reform requires constitutional changes, which will likely get through the MORENA-controlled Congress and state legislatures. About those airport bonds: After a significant portion of bondholders in Mexico's canceled airport project indicated they would reject a buyback deal, the government offered a better deal with a higher tender price and greater protections. On Wednesday, both the peso and value of the bonds rose. Also, today marks both the one-year anniversary since AMLO formally launched his presidential campaign as well as the day of the Virgin of Guadalupe. MORENA, the name of the party that AMLO founded, itself alludes to Mexico's highly venerated virgin. A Friday Supreme Court decision set up a standoff with the presidency. The Court, which still must hand down a definitive ruling, suspended legislation enacted in November that involves cuts to public-sector salaries and dictates that no public servant can earn more than the president. While on the campaign trail, AMLO promised to cap government wages and trimmed his own salary to roughly $5,300 a month, or about 40 percent of what his predecessor earned. During his December 10 press conference, López Obrador described the salaries of some high-level officials—and justices in particular—as “exaggerated and offensive,” and reaching levels as high as $30,000 per month. On Monday morning, Luis Vega Ramírez, a spokesman representing federal magistrates, argued that no justices earn such sums, although official records do indicate that Supreme Court ministers are among the highest-paid public servants in Mexico. Vega also charged that the row over the salary law is only one way that the new government is seeking to weaken the judiciary’s independence, with other measures including a constant rotation of justices and efforts to discredit the judiciary. AMLO has said he will respect the court’s suspension of the law but that the ultimate decision lies in the hands of Congress, given that his administration will be submitting its economic package to legislators on December 15. Ricardo Monreal, the Senate leader for AMLO’s majority-holding party MORENA, said Monday that the upper house will challenge the Court’s decision to suspend the law. For more on the Supreme Court and AMLO’s selections for vacancies, see Day 6. In other news, AMLO announced plans over the weekend to invest $8 billion in a new refinery in his home state of Tabasco as part of his goal of moving toward self-sufficiency and lower gas prices. Bloomberg reports that Mexico’s oil sector has seen 14 straight years of declining production. Oil is a touchy subject in Mexico, where March 18 is still celebrated as the anniversary of when President Lázaro Cardenas expropriated the oil industry from foreign companies in 1938. Any moves to open up the sector to private investment have been a source of controversy ever since, and an energy reform pushed through by AMLO’s predecessor was no different in that regard. For his part, López Obrador promised on the campaign trail not to end the reform, but he hasn’t spared harsh words for it. On December 7 he went so far as to call it a “disaster” and that its defenders owe the Mexican people an apology. But he also said he would not cancel the reform because he has a plan to rescue the energy sector and, on December 8, he said he will lay the first stone of a refinery he pledged to build in his home state of Tabasco. As we noted on Day 6, AMLO has called for a three-year freeze of oil auctions. The president also said fuel theft, known as huachicoleo, will become a grave crime in Mexico. Oil theft, typically carried out by organized groups, is thought to cost the country $1 billion in annual revenue. With a week under his belt, how is AMLO’s Fourth Transformation going so far and what will it bring? Writing in Reforma, Carlos Bravo Regidor explains why the term itself makes for a “cocktail of historical nostalgia, political rebellion, and social reorganization” that will be a challenge for those writing political analysis. In El Financiero, Ana María Salazar makes five predictions about the López Obrador presidency. “He’s not scared of disorder or crisis,” she writes. “In fact, it will be normal for there to be disorder and crisis during all of his six-year term.” Finally, James Bosworth of Hxagon writes that commentary on AMLO either sees him making moves that will be enormously good or bad, but in the end it’s quite likely that he will be little more than average. Former Guadalajara Mayor Enrique Alfaro took the reins as governor of Jalisco, a state plagued by violence stemming from organized crime. (See Day 3 for more.) Alfaro, who abandoned the Citizens’ Movement party after winning the gubernatorial race and is seen as a possible opposition figure to AMLO, told the president to count on Jalisco as an ally in his national transformation before adding that his government would "respect the federation but won't kneel before it." Also on Thursday, López Obrador submitted a list of three candidates to Mexico’s Senate to fill a vacancy on the Supreme Court. Two of three are women and both are members of his political party, MORENA, raising concerns about their ability to remain impartial. The selected candidate will need two-thirds ratification in the Senate. AMLO will get another chance to make his mark on the court when the term of one of the only two women justices, Margarita Beatriz Luna Ramos, ends in January. The country’s top court has 11 magistrates who serve 15-year terms, meaning that all of the sitting justices were appointed during the sexenios of Presidents Vicente Fox, Felipe Calderón, and Enrique Peña Nieto. The court’s president, elected by the sitting justices, serves in that role for four years, and a new one will also be chosen in January. The canceled airport project continues to be a thorny issue, with a group of bondholders rejecting a buyback plan proposed by the AMLO government on Wednesday. Raymundo Riva Palacio does the math in his El Financiero column and shows AMLO’s alternative airport plan will end up being more costly, proving that the new president values making good on his campaign promises over investor confidence. Claudia Sheinbaum was sworn in as the new mayor of Mexico City on Wednesday, becoming the first woman elected to the post in one of the biggest cities in the Western Hemisphere. A scientist by training, Sheinbaum rode AMLO’s wave of popularity all the way to electoral victory in July. As a member of MORENA, the party López Obrador founded, her inauguration marks the first time in 21 years that somebody from the left-leaning Party of the Democratic Revolution won’t be in the post. It’s also been that long since the president and the capital’s head of government are from the same party. "We hope she knows how to say no to the president when the city needs her to," remarked an opposition legislator at her inauguration. One of her first actions was to announce the end of Mexico City’s riot police. The move is highly symbolic as the force was used in the repression of the 1968 student movement. These police will be incorporated into civil protection units. AMLO made a similar move as he took over the presidency in that he disbanded the president’s secret service. The fact that Sheinbaum now holds one of the top political positions in the country means she is already among the names being floated as a future presidential contender to succeed AMLO in 2024. But will López Obrador’s current popularity sustain her own? She takes office with an approval rating of 51 percent. Speaking of which, Jorge Buendía examines AMLO’s teflon factor in El Universal, noting that his approval rose in recent years while that of his predecessor Peña Nieto fell. But what will happen as we get deeper into an AMLO presidency? A new party coming into power means a whole host of new names to track. Nación321 has a handy guide to the incoming cabinet members. For example, Chief of Staff Alfonso Romo represented Mexico in the 1996 and 2000 Olympics in the sport of equestrian jumping. Interior Secretary Olga Sánchez Cordero was, in 1984, the first female notary in Mexico City to pass the exam for her post—and at a point when the notary school didn’t even have a women’s bathroom. And Finance Secretary Carlos Urzúa has written two books of poetry. The shadow of doubts about Mexico City’s canceled airport megaproject hangs over the new government, with the peso’s Monday gains wiped out come Tuesday morning. Fitch said the AMLO government’s pitch to buy back as much as $1.8 billion of $6 billion in debt for the airport’s construction would alleviate short-term risks. Meanwhile, Moody’s signaled an uphill road with investors. “The damage is done,” said the credit agency’s Jaime Reusche, per CNN Expansión, adding that the markets will need an injection of confidence. But that’s far from the only persistent problem for the incoming government. Dallas Morning News’ Alfredo Corchado reports on a grenade attack against the U.S. consulate that took place hours before López Obrador’s inauguration. The offices were closed and damage was minimal, but the attack—thought to have been carried out by the Jalisco New Generation Cartel—is a reminder of the organized crime battle and record high murder rate that López Obrador now has to contend with. As former U.S. diplomat John Feeley told Corchado, “The FBI and ATF will be all over this and it will be an early test of law enforcement collaboration in the AMLO era." On Monday, gunmen in Jalisco (of which Guadalajara is the capital) ambushed state police who were transporting a prisoner and killed six policemen. Another lingering issue is corruption. Animal Político’s Nayeli Roldán, who in 2017 reported on a federal government scandal dubbed the Master Swindle, covers AMLO’s appointment of “superdelegates” in each of Mexico’s states to oversee federal programs at the state level. Concern exists about the degree to which the new posts could lead to corruption, particularly given the questionable experience of some of those selected. Anger over corruption was a motivating factor for voters to reject the sitting party in the July election. AMLO, seeking to assure supporters that he will be held to new standards, announced on Tuesday that he would submit a proposal for a constitutional reform that would end immunity from persecution—known as “el fuero”—for presidents. Still, despite the storm clouds, AMLO is riding high on a wave of public support. An El Financiero poll shows that, in the wake of his inauguration, a whopping 83 percent of Mexicans feel positive about the future of the country. López Obrador promised to work 16-hour days as president, including daily early-morning press conferences. He held his first at 7 a.m. on December 3, saying, “How do we begin?” before promising a transformation in the public life of the country. One change was the fact that AMLO, a sitting president, traveled on a commercial flight for a trip to Veracruz the day before. Meanwhile on Monday, the presidential jet departed Mexico for California to be put up for sale. 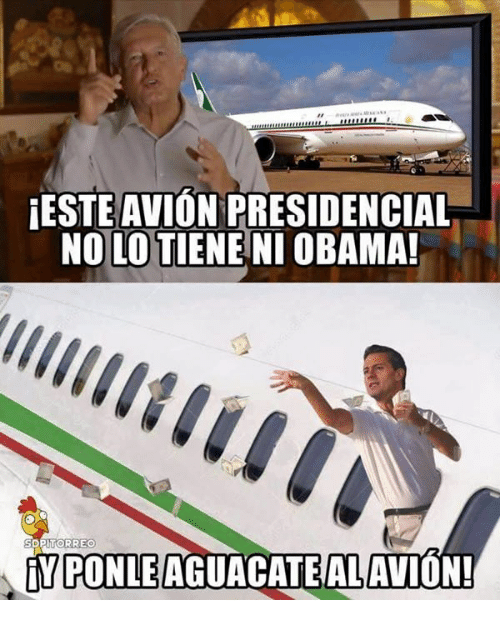 Back in 2016, AMLO launched a thousand memes when he described the aircraft as so opulent that “not even Obama has one” like it. But Bloomberg reports that the Boeing Dreamliner will likely sell for at least $76.3 million less than what Mexico paid for it. The finance secretariat has released photos of the jet’s interior. Airports and air travel are dominating AMLO’s first days, particularly given news that the construction of the canceled Texcoco airport would continue amid negotiations with bondholders, contributing to a Monday market rally. That doesn’t mean the AMLO administration is in the clear on the matter, with the president dodging questions about his government’s bond buyback plan during his morning press conference. Beyond Mexico, incoming Foreign Secretary Marcelo Ebrard visited Washington to meet with his U.S. counterpart Mike Pompeo and U.S. Department of Homeland Security Secretary Kirstjen Nielsen. Migration was a likely point of discussion, although a BuzzFeed article reported that the holdup in a bilateral deal on the migrant caravan has more to do with disagreements between the Departments of Justice and Homeland Security than between the two countries. The second day of the new administration brought news that the construction of the partially completed, $13 billion Texcoco airport will continue—at least while the Mexico City airport council undertakes an evaluation in the face of financial and legal concerns. The landmark infrastructure project of the prior administration was voted down in a popular referendum, despite polls showing most Mexicans approved of the new airport, which would have been the world's third biggest. The outcome of the controversial October referendum, in which only a little more than 1 percent of the electorate participated, was followed by the peso's worst daily loss since the November 2016 victory of Donald Trump. The December 2 news does not mean a reversal on the airport decision in the long-term, with council meeting minutes indicating the shutdown of construction may be delayed while evaluating how to compensate bondholders, but will still happen before the end of the year. Just a day earlier, in his inaugural remarks, AMLO spoke of going ahead with his alternative plan: construction of runways at the Santa Lucia military base. The new president takes office riding a wave of optimism, but a new Consulta Mitofsky poll shows that mirrors what happened with his predecessors. Vicente Fox, the president whose victory saw the end of seven decades of rule by the Institutional Revolutionary Party, started his term with an approval rating more than 11 points higher than that of López Obrador. On the other hand, more than half of Mexicans believe AMLO will accomplish what he’s promised—a higher rate than any of his three predecessors. He won’t have a long honeymoon, though: the largest portion of respondents expects to see changes within the first six months. Just after his swearing in at Mexico’s Congress, López Obrador launched his presidency with criticism of the neoliberal economic model of the past 36 years before going on to condemn the four-year old energy reform. “Neoliberal economic policy has been a disaster,” he said, adding, “It sounds strong, but privatization in Mexico has been synonymous with corruption.” AMLO looks to the past for inspiration, and the new leader praised earlier economic policies, particularly those of 1958 to 1970. In a series of wide-ranging promises, López Obrador pledged social programs, an economic zone near the northern border, cancellation of the education reform, doubling of the minimum wage, austerity measures for government officials, and creation of a national guard. Although he repeatedly condemned the corruption of prior governments, he also said he will not seek prosecution for their crimes. Toward the end, the new president related a story of a cyclist who rode alongside AMLO's white Jetta as he made his way to Congress, telling him, "You don't have the right to fail us." In what has become one of the most quoted lines of the day, López Obrador said, "That is the commitment I make with the people: I don't have the right to fail." The new government also marked inauguration day by opening the gates of Los Pinos, previously the presidential residences and with highly restricted access for some 80 years. A reported 30,000 people visited the grounds in its first day open to the public. For weeks leading up to AMLO’s inauguration, rumors swirled about who would attend, along with controversy over which leaders received an invite. In the end—and despite some notable absences due to the G20 taking place in Argentina—a large number of leaders from across the Americas and beyond were there, from Colombian President Iván Duque to Cuban President Miguel Díaz-Canel, as well as a large U.S. delegation that included cabinet members, legislators, and governers. U.S. Vice President Mike Pence and Ivanka Trump attended the swearing-in ceremony, but it’s thought that they left before encountering Venezuela’s Nicolás Maduro, who skipped that portion, at subsequent celebrations. Foreign policy didn’t stand out among AMLO’s priorities, either during his campaign or on inauguration day, but that doesn’t mean there aren’t signs of turbulence ahead. U.S. President Donald Trump, who signed the renegotiated trade deal with Mexico and Canada called USMCA on the sidelines of the G20, threatened on his way back from Argentina to give formal notice to Congress that he will terminate the original NAFTA, in a move designed to pressure the incoming Democrats in the House of Representatives to sign the new deal—or face the possibility of no North American trade deal at all.